Posted on August 1, 2018 by believepodcast_28cea4. Tony DuShane discusses with us his turbulent time growing up Jehovah’s Witness. 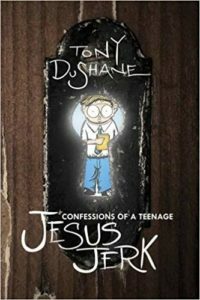 Tony is known for his writing with the San Francisco Chronicle as well as the novel Confessions of a teenage Jesus Jerk. He’s completed the movie of the same title recently and we discuss the process of his writing and making the movie. Check out his book it’s one of my favorites and the movie is pretty kickass too.